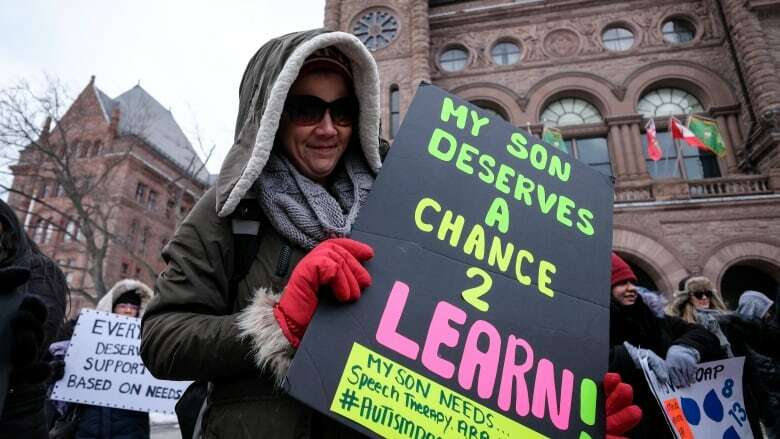 Families of children with autism in Ontario say the changes to the province's autism program will leave them unable to pay for intensive therapies that can cost up to $100,000 a year while the provincial government says the new program is a much fairer system. Changes to Ontario's autism program set to come into effect April 1 have left some families of children on the autism spectrum struggling to determine how they'll pay for expensive therapies. Under the new program, the wait-list for government-funded treatment, which has 23,000 children on it, will be eliminated in exchange for direct funding for all kids with autism – with $20,000 per year for treatment for children under age six and $5,000 a year for children ages six to 18. The government says families will be eligible to receive a total of up to $140,000 per child until the age of 18. Some families say this funding model is unrealistic given that intensive therapies can cost up to $100,000 a year while the provincial government says it's a much fairer solution. According to the province, 8,400 children are receiving government-funded therapy under the existing program, but almost three times that are waiting to access it. "We've heard how the autism program isn't working for the families who need support for their children," said Lisa MacLeod, minister of children, community and social services, when announcing the changes last month. "We recognize how difficult it is for families once they receive a diagnosis, and we want to simplify how they navigate throughout that process." Four-year-old Elliott Heinecke cries in frustration as his little hands struggle to place a puzzle piece of a shark in its corresponding space. In a soothing tone, his therapist encourages him to keep going, to keep trying. A moment later, a smile spreads across his tear-stained face as he puts the last piece in its place, and he babbles with delight. Elliott is only now starting to recognize objects, is only now starting to speak. It took hours of therapy to get to this point, and he needs much more, his parents say. He's been prescribed 20 hours a week of therapy. His parents can barely afford the six hours he's getting now. "It's awful," said Elliott's mom, Jessica Knowles. "Imagine only being able to feed your child one meal a day when you know they need three. Imagine only being able to provide a roof over your child's head and warmth one day out of seven days a week. "This is a medically necessary treatment that Elliott needs in order to thrive in life, and as it stands, I can't provide the medication that he needs." Elliott's diagnosis of severe autism — a neurological disorder that affects communication — at the age of three was devastating. The attempt to treat it has been, too, Knowles said. The six hours of therapy Elliott receives at a learning centre in Innisfil, Ont., costs more than $1,200 a month. "We've cashed out RRSPs, remortgaged the house," Knowles said. "My husband works as many possible hours as he can each and every day. He's working three jobs as it is." The family was willing to do what it takes: wait, along with thousands of other families, for what they considered the light at the end of the tunnel: publicly funded therapy based on each child's individual needs. But Ontario's Conservative government intends to eliminate that program in favour of giving families money to fund treatment themselves. The amount each family will get depends on the age of the child and the family's income. It has also said it will double its investment in autism diagnostic hubs, which currently receive $2.75 million a year, to address the backlog of 2,400 children waiting an average of 31 weeks to be assessed. Knowles has done the math. Her son will receive $71.35 a week, which she says is not enough to cover even two hours of therapy. "It's outrageous," Knowles said. "They're punishing families who are struggling as it is." Applied Behavioural Analysis, or ABA, is clinically proven to help a child with developmental delays significantly improve learning and social skills. Programs are typically tailored to the individual child's needs and involve intense one-on-one therapy, designed to teach language, communication and interpersonal skills to help children integrate into school. Since autism is a spectrum disorder, the number of hours needed depends on the severity of each child's diagnosis. For some, a few hours may be enough to modify troublesome behaviour or improve vocabulary. For others, such as five-year-old Lauren Yakeley, the 35 hours a week she's receiving now help her learn basic life skills, such as putting a fork to her mouth. It's therapy provided under Ontario's publicly funded autism program that Lauren fears she will lose when the new program goes into effect. "They say it takes a village. Well, the government, our village, is basically saying we don't care about your kids," said her mother, Lisa Yakeley, a sob catching her voice. "They're not factoring in we are real people, and our children have needs. It's unbelievable that we are just numbers on a spreadsheet to them." Knowles and Yakeley are two of the voices in a YouTube video created by Maritza Basaran, whose three-year-old son, Harrison, was recently diagnosed with autism. Basaran put out a call to a Facebook group made up of parents of children with autism to share their stories. "The goal of the video is to show the general public what [Ontario Premier] Doug Ford and his minister are doing to 'clear the wait list,'" Basaran said. "They've angled it as doing the right thing to help those languishing on the wait-list. I'm on that wait-list. It's hard, it's not fun, but I was willing to wait if one day my son would get needs-based therapy." The video is just one form of protest. 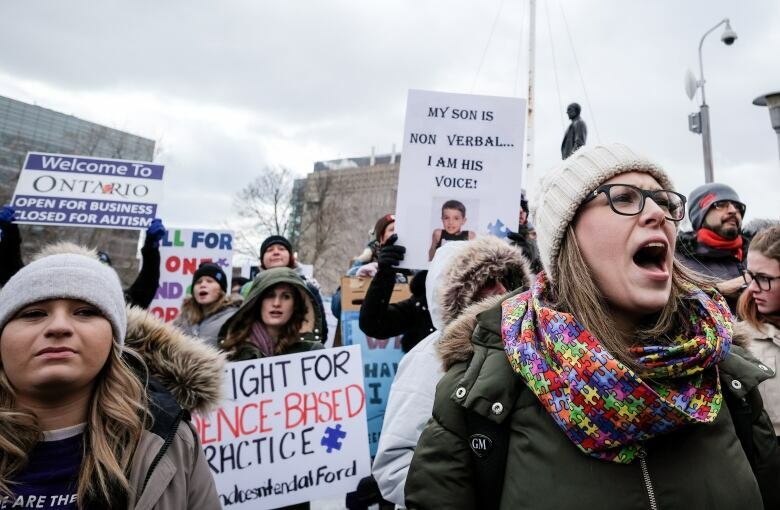 From the rally at Queens Park in Toronto last Thursday to a standing protest outside MacLeod's Nepean, Ont., riding office, parents have been defiant and desperate. Christine Clayton has been to every protest. Her seven-year-old son, Miles, waited three years to receive publicly funded ABA therapy. He now receives 40 hours a week and is beginning to verbalize what he needs. It's a whole new window into his world, and it's getting wider every day, she says. To lose the fully funded program means losing his potential, said Clayton. "Devastated doesn't even come close to how we're feeling," Clayton said. Clayton and a group of parents have repeatedly asked McLeod for an audience to offer their ideas on how to mitigate costs. Possible solutions include additional tax breaks or pushing insurance companies to cover treatment, Clayton says. "It is not OK to keep saying you're clearing the wait-list but making services unattainable for thousands of others," Clayton said. "That's just shifting what's happening from Column A to Column B. What's worse, they're taking away our hope."